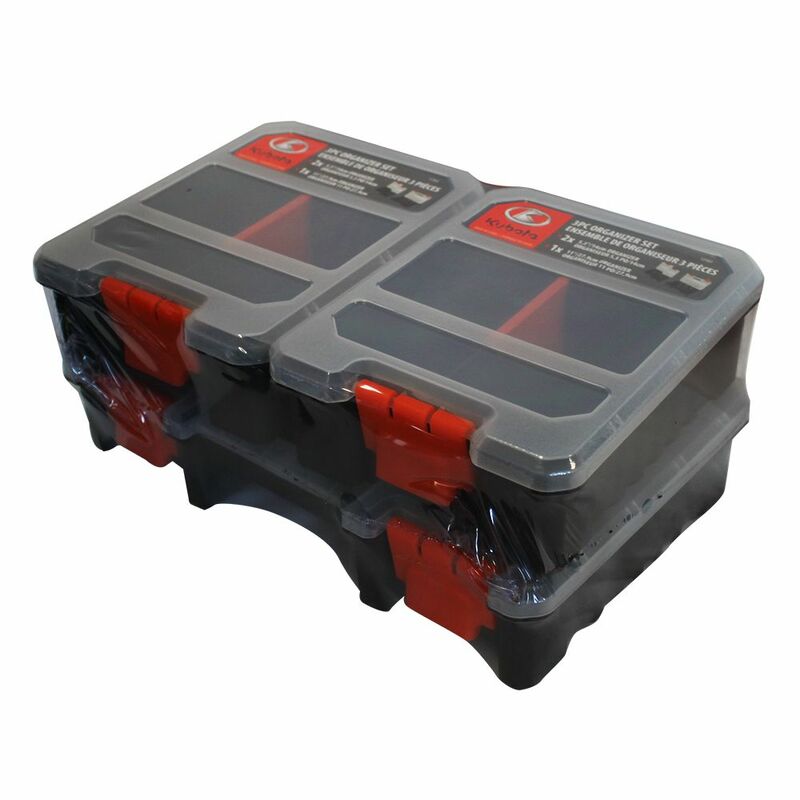 This Kubota Compartment Organizer, 3 pack, is a perfect storage solution for small parts. Designed for the jobsite with a clear lid for easy visibility, rugged latches and large cups for quick access. The PACKOUT modular storage system is the industry's most durble and versatile storage system. The PACKOUT organizer is constructed with impact resistant materials so it can withstand harsh jobsite environments. An IP65 rated weather seal protects tools, accessories, and small parts from rain and other jobsite debris. The organizer's interior features 10 removable storage bins that are easily mountable on the jobsite for quick access. The transparent lid of the organizer seals the bins to prevent contents from migrating and shifting during transport. Heavy duty latches and reinforced hinges ensure that the organizer keeps the contents contained and protected. The PACKOUT modular storage allows users to customize and build their own storage system to easily transport and organize tools and accessories. 3 pc Organizer Set This Kubota Compartment Organizer, 3 pack, is a perfect storage solution for small parts. Designed for the jobsite with a clear lid for easy visibility, rugged latches and large cups for quick access.